The emotional Ray Donovan seems tailor-made for his job. The tough, protective brother can't help but do whatever it takes to protect his family, so it's only sensible he'd do the same for his clients. Though we're sure the pay from Hollywood's elite doesn't hurt, either! 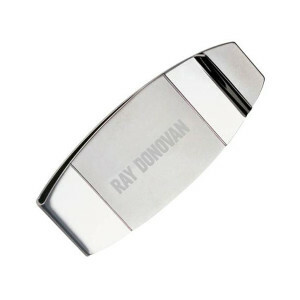 Take a cue from Ray and keep your hard earned cash safe with this Ray Donovan Two-tone Money Clip. The sleek clip, with a matte silver and chrome finish, is etched with the "Ray Donovan" logo, warning everyone that this cash belongs to a number one Donovan fan!